For a bit more than a year now, I’ve been planning a three month engagement with Rockhampton – preparing for and carrying out resistance to Exercise Talisman Sabre. My efforts are in the context of a wider “movement” (or impulse towards movement) that is the Peace Convergence. www.peaceconvergence.com TS11 is the 4th occasion on which people have taken action in response to these bi-annual war-games. 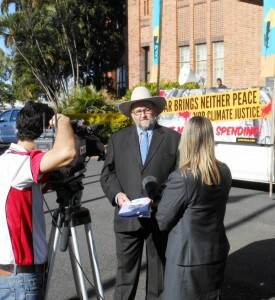 Graeme Dunstan of www.peacebus.com is convenor of this year’s peace convergence. There’s a lot at risk, and a high price to pay (losing my family and spending years in prison) and so I’m keen to make it count for something. (Make it count for as much as I possibly can). honestly debates the US alliance and the wars in Afghanistan, Pakistan, Iraq, Libya, and Syria. The nature of the ploughshares action brought early coverage in April from Adrian Taylor of the Rockhampton Morning Bulletin (about three weeks before I got to town). 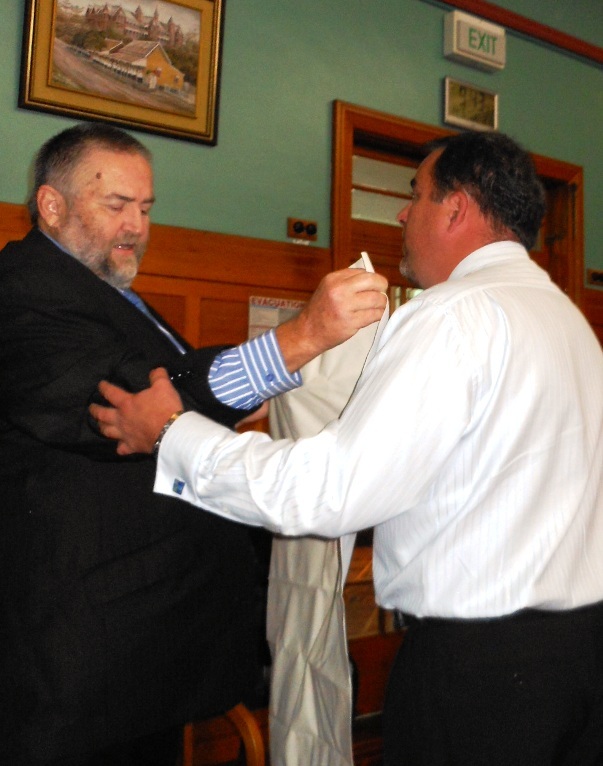 Adrian is a 30 year veteran journalist now living in regional Queensland. There was a television story on Seven that I didn’t see, and a follow-up from the Bulletin. In May just the fact of our (Graeme Dunstan and I) arrival was enough to generate some stories. In June we turned to display and symbol type actions to make stories (attempt to enter barracks, make a fuss at a Council meeting, ambush the Mayor at a shopping centre). My communication to Mayor Carter. The only words I've been able to say to him. Rockhampton CEO Evan Pardon tries to manhandle me out of the Council chamber. He failed. 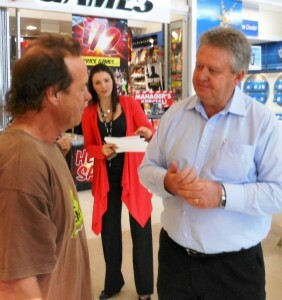 Ambushed at Yeppoon Central. He doesn't really want to listen to me. But he has to talk with Paul Bambrick, local Greens activist. To the action stories there’s a response through the Bulletin (texts, letters, online comment) from a small, bigoted, reactionary group who just call us names. I think of them as the vigilante mob. I am apparently a terrorist, a traitor, a serial pest, and/or a lunatic criminal. I should go to prison, Afghanistan and/or the loony bin. Or be used for target practice. 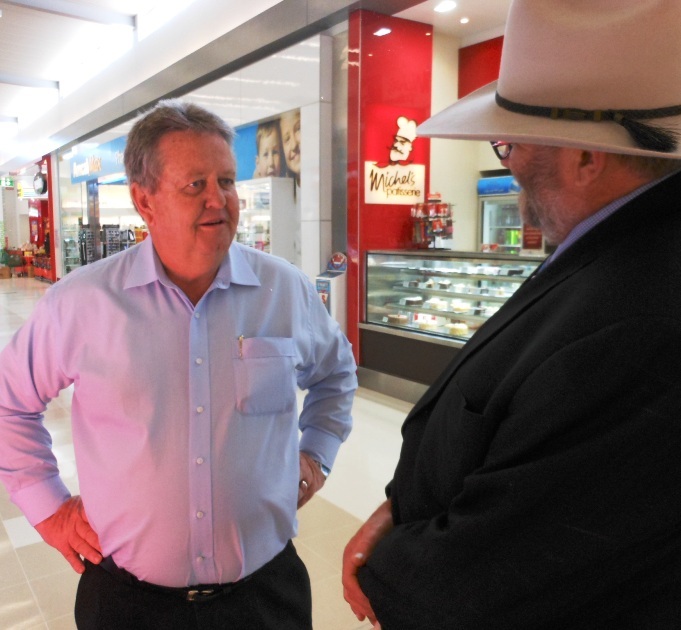 “JewBoy” from Kawana said in the Buuly’s online comments that if I’d been wearing Moslem headgear instead of a cowboy hat I would have been arrested like I oughta bin. He was very insightful. This is the crew that tries to shut down discussion by threatening and being very unpleasant to anyone who challenges the social orthodoxy of the “Beef Capital of Queensland”. By now they’ve got the editor convinced this story has legs. Unfortunately they’ll also encourage a perception of the issues as divisive/combative. There might even be escalating sensationalism. In an Australian newspaper! WIN TV continues to provide stories about 1.45 minutes, and well constructed. Sarah Owens “gets” the big picture story, and each small story is placed in pretty accurate context. WIN coverage is assisted by a veteran cameraman. Seven’s not really up to speed yet, and we’re not seeing much of the ABC. Nor fm radio. I expect that will change. 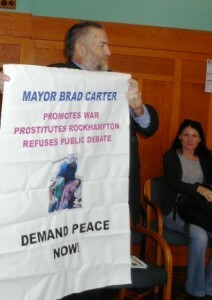 http://www.youtube.com/watch?v=fvDEtduEn1c (16 June – Mayor Brad Carter) (Where Paul and Edwina got a say, and where Brad Carter had to take part in debate (whether he wanted to or not). You can find some correction of 17 June’s Bulletin at www.cairnspeacebypeace.org The story now has momentum, and can provide opportunities for all the different groups to promote their own message, like Paul and Edwina did on WIN. Mayor Carter didn’t want a public debate on the war, but in the Rockhampton Morning Bulletin of 17 June as saying “he did not support the war, or conflicts in other countries”. The more good folk who come in on these opportunities for participation, the stronger we all become. Noel Preston says he’s writing an opinion piece for the Bulletin about the arms trade. I’m hoping the Queensland Greens will take advantage. There’s a Catholic Peace and Justice Gathering next week which will consider the Talisman Sabre Exercises, and for which I’m writing a letter to Rockhampton’s Catholic Bishop, Brian Heenan. So the media campaign is going well. The social networking is great on the Capricorn Coast and mediocre in Rockhampton. The programme of public speaking is pure gold! 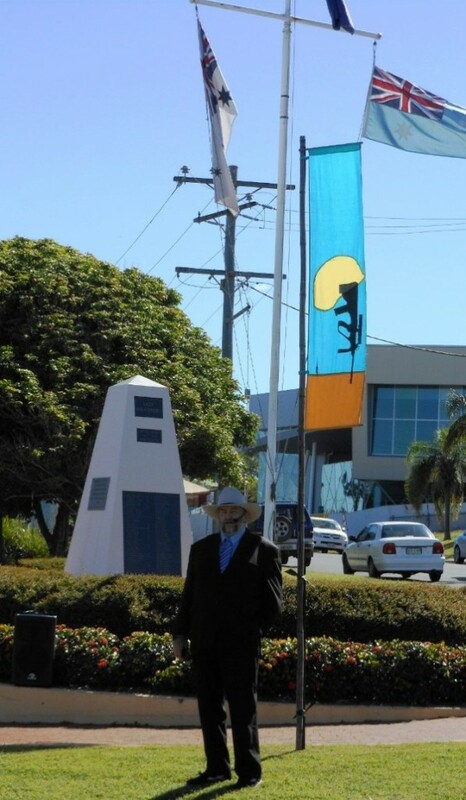 Spruiking at the ANZAC Shrine in Yeppoon. 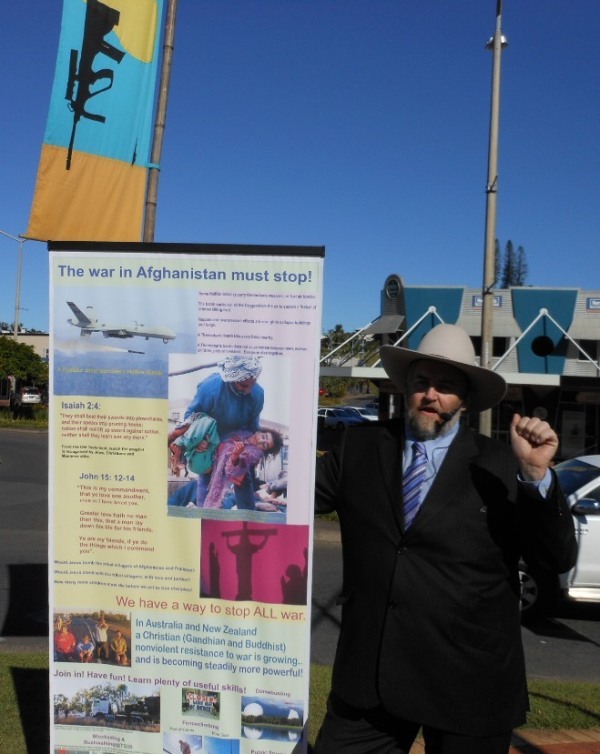 I get strong recognition with my Bob Katter costume (just right for the Beef Capital of Queensland), and I get much affirmation from the Rockhampton people when I call for an end to war. I expect that by the first half of July, I’ll be able to go anywhere in public and message for peace effectively. Leading for me to a crescendo of nonviolent civil disobedience and prison time as the moon waxes in mid July. Every time I spruik to the intersection at East St and Denham St in Rockhampton, I feel uplifted. Which makes me very happy with the state of things.